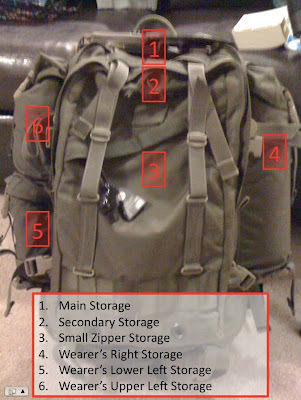 A few months back after checking my bug-out bag I started getting this terrible feeling in the back of my head that I needed to pull it out of my truck and perform a thorough inspection of content. After weeks of being lazy and saying, "I'll do it next weekend" I finally decided to make it my new year's resolution to get the major reorganization done and get the survival/preparedness monkey off my back. Not all bug-out bags are the same. My bag is not an all inclusive "live out of and survive bag" but it is part of a system of survival that when used together meets the requirement. You may notice a few key items missing from the bag, why? Because I have those items in other logical locations. Flashlight for instance. One would think that you would keep that in your main bag. That may be true for you. I have one 3D cell LED MAGLITE in my truck for roadside and general use and I keep a Fenix TA-30 in my messenger (office/work/Every Day Carry or EDC) bag for emergency use because it's always with me. I have a few Surefire lights, but believe it or not, Fenix lights give you the same bang for less money. In addition to the video, I took some still shots of everything so you can have a better idea of how the bag is organized, etc. As you can see above, things started out a little messy. Take note of the yellow and green dry bags that I have used to store items in my main storage (1). Purchasing colored dry bags makes it easier when organizing your gear. I will be the first to tell you that being organized can be the difference between success and failure when surviving in any environment. When in past military training, I was blindfolded and asked to locate all of the gear I was wearing. This was a valuable learning technique on the importance of gear organization. Although the purpose was not immediately clear at the time, I found out later the reasoning behind the training. You may not always have use of your eyes in a survival situation. Smoke, fumes and darkness may be there to hinder your access to gear. Storm whistle (to call for help if needed). The best place for a whistle is somewhere easily accessible and somewhere you don't have to guess about. I recommend having more than one in your bag. They are cheap and light. Don't store your batteries in your bag. Keep them with your EDC office bag. They will get messed up in the summer heat. I have replaced all hazardous/unsafe items in my bag with non-hazardous substitutes. For items that had no viable replacement, I simply transferred them over to my EDC bag, i.e. batteries, lighter, etc. I hope you have enjoyed your time spent here at SurvivalThinkTank.com and at TheRoadWarri0r YouTube Channel. I look forward to any and all comments and video responses. Love the videos, I also live in NoVa and see that your B.O.B. setup suits my situation perfectly. The one question I have is what kind of Katadyn water filter is it you have(and if u have tested it and what u would rate it). I agree water is by far the pound for pound heaviest thing u can carry, and I would be very appreciative if could add the details of the Katadyn. Thanks for all your info, STACK IT DEEP!